SedScan® is the first automated settling test developed to take away the technician and reduce the test error through the use of a control system and apparatus for measuring the performance of solid-liquid and liquid-liquid separation behaviour of slurries or pulps and liquids of variable density. The equipment was developed in 2012 by a small consortium of international process engineers based on the need to improve accuracy of laboratory based tests that focus on characterising settling behaviour, primarily when dosed with additives that influence settling speed and density separation of the products under test. .
SedScan® was principally developed for the solid-liquid separation industries where thickeners and clarifiers are used to recover liquids from slurries and pulps such as those generated in the mining industry (tailings and concentrates) as well as waste water and potable water treatment. The technology can be applied to liquid-liquid applications such as the medical (blood settling) and oil refining industries. SedScan® is patent pending and currently in development to be applied on both smaller and larger testing scales. Improve the current methodology of performing a solid-liquid or liquid-liquid settling test by reducing human error and increasing data collection frequency, precision and overall accuracy. Allow for the simultaneous testing of multiple samples, considering the same standardised operating conditions and test parameters. The equipment has been developed to allow it to be transported between laboratories or remote locations as needed. Protect your Models and Copyright! Raw data is uploaded to a client based cload facility (of your choice), data processed and sent to the customer/client as readable data or final report. Reduced cost compared to standard settling tests with increased data collection. Slurries, pulps or liquids with suspended particles are often required to have the suspended particles and process liquor (often referred to as supernatant liquid) separated. This process is often referred to as thickening or clarification and applies to multiple industries with the goal of recovering either the process liquor (supernatant) or the suspended particle material for reuse in the processing procedure, further processing, or disposal. Chemical products (such as flocculants and coagulants) may be mixed with the slurry as it is fed into the thickener or clarifier. This is usually referred to as the feed-well of the tank where mixing occurs between the slurry and the additive to promote gravity sedimentation of the particles in the slurry to accumulate in the mud bed and be removed by the underflow pump. To identify the type of chemical additive to use in a solid-liquid separation, there are various styles of tests performed on a laboratory scale. The most common standard is a “jar-test” whereby a flask of known volume, containing slurry of a known solids mass and volume, is dosed with a chemical additive and mixed, normally by hand, and then the settling bed position is determined manually with a stopwatch and visual height reference, over a fixed period of time. Data from the test is commonly interpreted using various methods, primarily the Kynch and Coe-Clevenger methods, which rely on the accuracy of the data collection to identify the optimum parameters of the chemical additives to be used in the full scale process operation. Allow computational statistical analysis of the results both during and after the test is conducted. 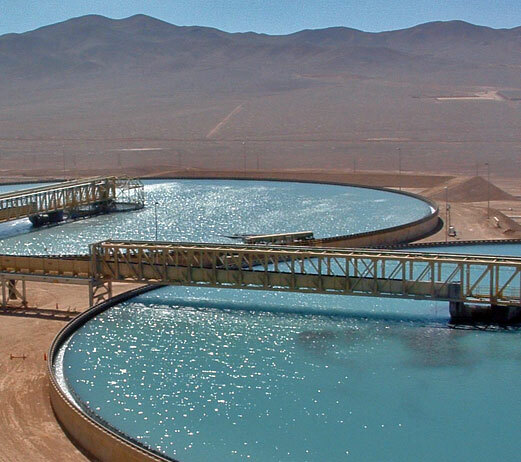 For the mining industry in particular, the following are areas where SedScan® has been implemented to improve processing plant stability and tailings/concentrator characterisation. Prediction of supernatant/overflow clarity giving real NTU values with time. The dense fraction separation of liquids is often required in many process fields to refine or purify a particular product or material. Oil refinery is a specific case whereby crude oil is separated into fractions by the fractional distillation process. For this particular process, the density of the various extracted liquids, such as diesel, kerosene and gasoline vary and provide a form of distinguishing this property through dense fraction separation. There are many varieties and techniques of liquid-liquid separation specific to a particular process or methodology. Those whereby a boundary can be visually distinguished or through emitted wavelength propagation characteristics, can benefit from the use of SedScan® to determine these boundary changes with time. To purchase SedScan® equipment, or to enquire about custom applications, please use our contact form at the bottom of the page. We have negotiated a testing service (only relating to the mining industry) which is provided via our industry partner, Tailpro Consulting, located in Santiago, Chile. The units used are the Tailings V3.1, housed in a 12 rack system complete with control units and cloud connection services. No medical related testing services can be provided by Tailpro at this time. For testing services relating to the mining industry, please contact Tailpro Consulting via their website www.tailpro.com or use the contact form below.